This name uses Spanish naming customs: the first or paternal family name is Fujimori and the second or maternal family name is Fujimori. Alberto Fujimori (Spanish pronunciation: [alˈβeɾto fuxiˈmoɾi]; Japanese: [ɸɯʑiꜜmoɾi]; born 26 July 1938 or 4 August 1938) is a Peruvian former politician who served as the President of Peru from 28 July 1990 to 22 November 2000. His government is credited with the creation of Fujimorism, defeating the Shining Path insurgency and restoring Peru's macroeconomic stability. Fujimori ended his presidency by fleeing Peru for Japan amid a major scandal involving corruption and human rights violations. Even amid his prosecution in 2008 for crimes against humanity relating to his presidency, two-thirds of Peruvians polled voiced approval for his leadership in that period. A Peruvian of Japanese descent, Fujimori took refuge in Japan when faced with charges of corruption in 2000. On arriving in Japan, he attempted to resign his presidency via fax, but his resignation was rejected by the Congress of the Republic, which preferred to remove him from office by the process of impeachment. Wanted in Peru on charges of corruption and human rights abuses, Fujimori maintained a self-imposed exile until his arrest while visiting Chile in November 2005. He was extradited to face criminal charges in Peru in September 2007. In December 2007, Fujimori was convicted of ordering an illegal search and seizure and was sentenced to six years in prison. The Supreme Court upheld the decision upon his appeal. In April 2009, Fujimori was convicted of human rights violations and sentenced to 25 years in prison for his role in killings and kidnappings by the Grupo Colina death squad during his government's battle against leftist guerrillas in the 1990s. The verdict, delivered by a three-judge panel, marked the first time that an elected head of state has been extradited to his home country, tried and convicted of human rights violations. Fujimori was specifically found guilty of murder, bodily harm and two cases of kidnapping. In July 2009, Fujimori was sentenced to seven and a half years in prison for embezzlement after he admitted to giving $15 million from the Peruvian treasury to his intelligence service chief, Vladimiro Montesinos. Two months later, he pleaded guilty in a fourth trial to bribery and received an additional six-year term. Transparency International considered the money embezzled by Fujimori to be the seventh-most for a head of government active within 1984–2004. Under Peruvian law, all the sentences must run concurrently; thus, the maximum length of imprisonment remained 25 years. In December 2017, President Pedro Pablo Kuczynski granted the 79-year-old Fujimori a humanitarian pardon. The pardon was overturned by Peru's Supreme Court in October 2018 and Fujimori was ordered back to prison. On January 23, 2019, Fujimori was sent back to prison to complete his sentence with his pardon formally being annulled a month later. According to government records, Fujimori was born on 28 July 1938, in Miraflores, a district of Lima. His parents, Naoichi Fujimori (original surname Minami, adopted by a childless relative; 1897–1971) and Mutsue Inomoto Fujimori (1913–2009), were natives of Kumamoto, Japan, who migrated to Peru in 1934. In July 1997, the news magazine Caretas alleged that Fujimori had actually been born in Japan, in his father's hometown of Kawachi, Kumamoto Prefecture. Because Peru's constitution requires the president to have been born in Peru, this would have made Fujimori ineligible to be president. The magazine, which had been sued for libel by Vladimiro Montesinos seven years earlier, reported that Fujimori's birth and baptismal certificates might have been altered. Caretas also alleged that Fujimori's mother declared having two children when she entered Peru; Fujimori is the second of four children. Caretas' contentions were hotly contested in the Peruvian media; the magazine Sí, for instance, described the allegations as "pathetic" and "a dark page for [Peruvian] journalism". Latin American scholars Cynthia McClintock and Fabián Vallas note that the issue appeared to have died down among Peruvians after the Japanese government announced in 2000 that "Fujimori's parents had registered his birth in the Japanese consulate in Lima". Fujimori admitted during one of his trials that Spanish was in fact his second language, implying that Japanese may have been his native tongue. Fujimori obtained his early education at the Colegio Nuestra Señora de la Merced and La Rectora. Fujimori's parents were Buddhists, but he was baptised and raised as a Roman Catholic. While he spoke mainly Japanese at home, Fujimori also learned to become a proficient Spanish speaker during his years at school. In 1956, Fujimori graduated from La gran unidad escolar Alfonso Ugarte in Lima. He went on to undergraduate studies at the Universidad Nacional Agraria La Molina in 1957, graduating in 1961 first in his class as an agricultural engineer. The following year he lectured on mathematics at the university. In 1964 he went to study physics at the University of Strasbourg in France. On a Ford scholarship, Fujimori also attended the University of Wisconsin–Milwaukee in the United States, where he obtained his master's degree in mathematics in 1969. In 1974, he married Susana Higuchi, also Japanese-Peruvian. They had four children, including a daughter, Keiko, and a son, Kenji, who would later follow their father into politics. In recognition of his academic achievements, the sciences faculty of the Universidad Nacional Agraria offered Fujimori the deanship and in 1984 appointed him to the rectorship of the university, which he held until 1989. In 1987, Fujimori also became president of the National Commission of Peruvian University Rectors (Asamblea Nacional de Rectores), a position which he has held twice. He also hosted a TV show called "Concertando" from 1988 to 1989, on Peru's state-owned network, Channel 7. Fujimori won the 1990 presidential election as a dark horse candidate under the banner of Cambio 90 ("cambio" means "change") beating world-renowned writer Mario Vargas Llosa in a surprising upset. He capitalized on profound disenchantment with outgoing president Alan García and the American Popular Revolutionary Alliance party (APRA). He exploited popular distrust of Vargas Llosa's identification with the existing Peruvian political establishment, and uncertainty about his plans for neoliberal economic reforms. During the campaign, Fujimori was nicknamed El Chino, which roughly translates to "Chinaman"; it is common for people of any East Asian descent to be called chino in Peru, as elsewhere in Latin America, both derogatively and affectionately. Although he is of Japanese heritage, Fujimori has suggested that he was always gladdened by the term, which he perceived as a term of affection. With his election victory, he became just the second person of East Asian descent to become leader of a Latin American nation, after Fulgencio Batista (varied descent) of Cuba and the third of East Asian descent to govern a South American state, after Arthur Chung of Guyana and Henk Chin A Sen of Suriname (each of whom was never the strongest executive of his country). During his first term in office, Fujimori enacted wide-ranging neoliberal reforms, known as Fujishock. During the presidency of Alan García, the economy had entered a period of hyperinflation and the political system was in crisis due to the country's internal conflict, leaving Peru in "economic and political chaos". It was Fujimori's stated objective to pacify the nation and restore economic balance. This program bore little resemblance to his campaign platform and was in fact more drastic than anything Vargas Llosa had proposed. Nonetheless, the Fujishock succeeded in restoring Peru to the global economy, though not without immediate social cost. Fujimori's initiative relaxed private sector price controls, drastically reduced government subsidies and government employment, eliminated all exchange controls, and also reduced restrictions on investment, imports, and capital. Tariffs were radically simplified, the minimum wage was immediately quadrupled, and the government established a $400 million poverty relief fund. The latter seemed to anticipate the economic agony to come: the price of electricity quintupled, water prices rose eightfold, and gasoline prices 3,000%. The IMF was content with Peru's measures, and guaranteed loan funding for Peru. Inflation rapidly began to fall and foreign investment capital flooded in. The privatization campaign involved selling off of hundreds of state-owned enterprises, and replacing the country's troubled currency, the inti, with the Nuevo Sol. The Fujishock restored macroeconomic stability to the economy and triggered a considerable long-term economic upturn in the mid-1990s. In 1994, the Peruvian economy grew at a rate of 13%, faster than any other economy in the world. During Fujimori's first term in office, APRA and Vargas Llosa's party, the FREDEMO, remained in control of both chambers of Congress, the Chamber of Deputies and the Senate, hampering the enactment of economic reform. Fujimori also had difficulty combatting the Maoist Shining Path (Spanish: Sendero Luminoso) guerrilla organization due largely to what he perceived as intransigence and obstructionism in Congress. By March 1992, Congress met with the approval of only 17% of the electorate, according to one poll; the president's approval rate stood at 42%, in the same poll. In response to the political deadlock, Fujimori, with the support of the military, on 5 April 1992, carried out a presidential coup. also known as the autogolpe (auto-coup or self-coup) or Fujigolpe (Fuji-coup) in Peru. He shut down Congress, suspended the constitution, and purged the judiciary. The coup was welcomed by the public, according to numerous polls. Not only was the coup itself marked by favorable public opinion in several independent polls, but also public approval of the Fujimori administration jumped significantly in the wake of the coup. Fujimori often cited this public support in defending the coup, which he characterized as "not a negation of real democracy, but on the contrary… a search for an authentic transformation to assure a legitimate and effective democracy." Fujimori believed that Peruvian democracy had been nothing more than "a deceptive formality – a facade". He claimed the coup was necessary in order to break with the deeply entrenched special interests that were hindering him from rescuing Peru from the chaotic state in which García had left it. Fujimori's coup was immediately met with near-unanimous condemnation from the international community. The Organization of American States denounced the coup and demanded a return to "representative democracy", despite Fujimori's claim that the coup represented a "popular uprising". Foreign ministers of OAS member states reiterated this condemnation of the autogolpe. They proposed an urgent effort to promote the re-establishment of "the democratic institutional order" in Peru. Negotiations between the OAS, the government, and opposition groups led Albert Fujimori initially to propose a referendum to ratify the auto-coup, but the OAS rejected this. Fujimori then proposed scheduling elections for a Democratic Constituent Congress (CCD), which would draft a new constitution to be ratified by a national referendum. Despite a lack of consensus among political forces in Peru regarding this proposal, an ad hoc OAS meeting of ministers nevertheless endorsed this scenario in mid-May. Elections for the CCD were held 22 November 1992. Various states individually condemned the coup. Venezuela broke off diplomatic relations, and Argentina withdrew its ambassador. Chile joined Argentina in requesting Peru's suspension from the Organization of American States. International lenders delayed planned or projected loans, and the United States, Germany and Spain suspended all non-humanitarian aid to Peru. The coup appeared to threaten the reinsertion strategy for economic recovery, and complicated the process of clearing Peru's arrears with the International Monetary Fund. Peruvian–U.S. relations earlier in Fujimori's presidency had been dominated by questions of coca eradication and Fujimori's initial reluctance to sign an accord to increase his military's eradication efforts in the lowlands. Fujimori's autogolpe became a major obstacle to relations, as the United States immediately suspended all military and economic aid, with exceptions for counter-narcotic and humanitarian funds. Two weeks after the self-coup, however, the George H.W. Bush administration changed its position and officially recognized Fujimori as the legitimate leader of Peru, partly because he was willing to implement economic austerity measures, but also because of his adamant opposition to the Shining Path. With FREDEMO dissolved and APRA leader Alan García exiled to Colombia, Fujimori sought to legitimize his position. He called elections for a Democratic Constitutional Congress, to serve as a legislature and a constituent assembly. The APRA and Popular Action attempted a boycott of this election, but the Popular Christian Party (PPC, not to be confused with PCP, Partido Comunista del Peru, or "Peruvian Communist Party") and many left-leaning parties participated in this election. Fujimori supporters won a majority of the seats in this body, and drafted a new constitution in 1993. In a referendum, the coup and the Constitution of 1993 were approved by a narrow margin of less than five percent. Later in the year, on 13 November, General Jaime Salinas led a failed military coup. Salinas asserted that his intentions were to turn Fujimori over to be tried for violating the Peruvian constitution. In 1994, Fujimori separated from his wife Susana Higuchi in a noisy, public divorce. He formally stripped her of the title First Lady in August 1994, appointing their eldest daughter First Lady in her stead. Higuchi publicly denounced Fujimori as a "tyrant" and claimed that his administration was corrupt. They formally divorced in 1995. During his second term, Fujimori along with Ecuadorian President Sixto Durán Ballén, signed a peace agreement with Ecuador over a border dispute that had simmered for more than a century. The treaty allowed the two countries to obtain international funds for developing the border region. Fujimori also settled some issues with Chile, Peru's southern neighbor, which had been unresolved since the 1929 Treaty of Lima. The 1995 election was the turning point in Fujimori's career. Peruvians began to be more concerned about freedom of speech and the press. However, before he was sworn in for a second term, Fujimori stripped two universities of their autonomy and reshuffled the national electoral board. This led his opponents to call him "Chinochet," a reference to his previous nickname and to Chilean ruler Augusto Pinochet. Modeling his rule after Pinochet Fujimori reportedly enjoyed this nickname. In addition to the fate of democracy under Fujimori, Peruvians were becoming increasingly interested in the myriad allegations of criminality that involved Fujimori and his chief of the National Intelligence Service (SIN), Vladimiro Montesinos. Using SIN, Fujimori gained control of the majority of the armed forces, with Financial Times stating that "[i]n no other country in Latin America did a president have so much control over the armed forces". A 2002 report by Health Minister Fernando Carbone [es] later suggested that Fujimori was involved in the forced sterilizations of up to 300,000 indigenous women between 1996 and 2000, as part of a population control program. A 2004 World Bank publication said that in this period Montesinos' abuse of the power Fujimori granted him "led to a steady and systematic undermining of the rule of law". The 1993 constitution limited a presidency to two terms. Shortly after Fujimori began his second term, his supporters in Congress passed a law of "authentic interpretation" which effectively allowed him to run for another term in 2000. A 1998 effort to repeal this law by referendum failed. In late 1999, Fujimori announced that he would run for a third term. Peruvian electoral bodies, which were politically sympathetic to Fujimori, accepted his argument that the two-term restriction did not apply to him, as it was enacted while he was already in office. In the runoff, Fujimori won with 51.1% of the total votes. While votes for Toledo declined from 37.0% of the total votes cast in the first round to 17.7% of the votes in the second round, invalid votes jumped from 8.1% of the total votes cast in the first round to 31.1% of total votes in the second round. The large percentage of invalid votes in this election suggests that many Peruvians took Toledo's advice and spoiled their ballots. Although Fujimori won the runoff with only a bare majority (but 3/4 valid votes), rumors of irregularities led most of the international community to shun his third swearing-in on 28 July. For the next seven weeks, there were daily demonstrations in front of the presidential palace. As a conciliatory gesture, Fujimori appointed former opposition candidate Federico Salas as prime minister. However, opposition parties in Parliament refused to support this move, and Toledo campaigned vigorously to have the election annulled. At this point, a corruption scandal involving Vladimiro Montesinos broke out, and exploded into full force on the evening of 14 September 2000, when the cable television station Canal N broadcast footage of Montesinos apparently bribing opposition congressman Alberto Kouri for defecting to Fujimori's Perú 2000 party. The video was presented by Fernando Olivera, leader of the FIM (Independent Moralizing Front), who purchased it from one of Montesinos's closest allies[who?] (nicknamed by the Peruvian press El Patriota). Fujimori's support virtually collapsed, and a few days later he announced in a nationwide address that he would shut down the SIN and call new elections, in which he would not be a candidate. On 10 November, Fujimori won approval from Congress to hold elections on 8 April 2001. On 13 November, Fujimori left Peru for a visit to Brunei to attend the Asia-Pacific Economic Cooperation forum. On 16 November, Valentín Paniagua took over as president of Congress after the pro-Fujimori leadership lost a vote of confidence. On 17 November, Fujimori traveled from Brunei to Tokyo, where he submitted his presidential resignation via fax. Congress refused to accept his resignation, instead voting 62–9 to remove Fujimori from office on the grounds that he was "permanently morally disabled." On 19 November, government ministers presented their resignations en bloc. Because Fujimori's first vice president, Francisco Tudela, had broken with Fujimori and resigned a few days earlier, his successor Ricardo Márquez came to claim the presidency. Congress, however, refused to recognize him, as he was an ardent Fujimori loyalist; Márquez resigned two days later. Paniagua was next in line, and became interim president to oversee the April elections. When Fujimori came to power, much of Peru was dominated by the Maoist insurgent group Sendero Luminoso ("Shining Path"), and the Marxist–Leninist group Túpac Amaru Revolutionary Movement (MRTA). In 1989, 25% of Peru's district and provincial councils opted not to hold elections, owing to a persistent campaign of assassination, over the course of which over 100 officials had been killed by the Shining Path in that year alone. That same year, more than one-third of Peru's courts lacked a justice of the peace, because of Shining Path intimidation. Union leaders and military officials were also assassinated throughout the 1980s. Areas where Shining Path was active in Peru. By the early 1990s, some parts of the country were under the control of the insurgents, in territories known as "zonas liberadas" ("liberated zones"), where inhabitants lived under the rule of these groups and paid them taxes. When the Shining Path arrived in Lima, it organized "paros armados" ("armed strikes"), which were enforced by killings and other forms of violence. The leadership of the Shining Path was largely university students and teachers. Two previous governments, those of Fernando Belaúnde Terry and Alan García, at first neglected the threat posed by the Shining Path, then launched an unsuccessful military campaign to eradicate it, undermining public faith in the state and precipitating an exodus of elites. By 1992, Shining Path guerrilla attacks had claimed an estimated 20,000 lives over preceding 12 years. On 16 July 1992 the Tarata Bombing, in which several car bombs exploded in Lima's wealthiest district, killed over 40 people; the bombings were characterized by one commentator as an "offensive to challenge President Albert Fujimori." The bombing at Tarata was followed up with a "weeklong wave of car bombings ... Bombs hit banks, hotels, schools, restaurants, police stations and shops ... [G]uerrillas bombed two rail bridges from the Andes, cutting off some of Peru's largest copper mines from coastal ports." Fujimori has been credited by many Peruvians with ending the fifteen-year reign of terror of the Shining Path. As part of his anti-insurgency efforts, Fujimori granted the military broad powers to arrest suspected insurgents and try them in secret military courts with few legal rights. This measure has often been criticized for compromising the fundamental democratic and human right to an open trial wherein the accused faces the accuser. Fujimori contended that these measures were both justified and also necessary. Members of the judiciary were too afraid to charge the alleged insurgents, and judges and prosecutors had very legitimate fears of reprisals against them or their families. At the same time, Fujimori's government armed rural Peruvians, organizing them into groups known as "rondas campesinas" ("peasant patrols"). Insurgent activity was in decline by the end of 1992, and Fujimori took credit for this abatement, claiming that his campaign had largely eliminated the insurgent threat. After the 1992 auto-coup, the intelligence work of the DINCOTE (National Counter-Terrorism Directorate) led to the capture of the leaders from MRTA and the Shining Path, including notorious Shining Path leader Abimael Guzmán. Guzmán's capture was a political coup for Fujimori, who used it to great effect in the press; in an interview with documentarian Ellen Perry, Fujimori even notes that he specially ordered Guzmán's prison jumpsuit to be white with black stripes, to enhance the image of his capture in the media. Critics charge that to achieve the defeat of the Shining Path, the Peruvian military engaged in widespread human rights abuses, and that the majority of the victims were poor highland countryside inhabitants caught in a crossfire between the military and insurgents. The final report of the Peruvian Truth and Reconciliation Commission, published on 28 August 2003, brought out that Peruvian armed forces were also guilty of destroying villages and murdering countryside inhabitants whom they suspected of supporting insurgents. The majority of the atrocities committed between 1980 and 1995, however, were indeed the work of the Shining Path. The Japanese embassy hostage crisis began on 17 December 1996, when fourteen MRTA militants seized the residence of the Japanese ambassador in Lima during a party, taking hostage some four hundred diplomats, government officials, and other dignitaries. The action was partly in protest of prison conditions in Peru. During the four-month standoff, the Emerretistas gradually freed all but 72 of their hostages. The government rejected the militants' demand to release imprisoned MRTA members and secretly prepared an elaborate plan to storm the residence, while stalling by negotiating with the hostage-takers. On 22 April 1997, a team of military commandos, codenamed "Chavín de Huantar", raided the building. One hostage, two military commandos, and all 14 MRTA insurgents were killed in the operation. Images of President Fujimori at the ambassador's residence during and after the military operation, surrounded by soldiers and liberated dignitaries, and walking among the corpses of the insurgents, were widely televised. The conclusion of the four-month-long standoff was used by Fujimori and his supporters to bolster his image as tough on terrorism. Several organizations criticized Fujimori's methods against the Shining Path and the MRTA. Amnesty International said "the widespread and systematic nature of human rights violations committed during the government of former head of state Albert Fujimori (1990–2000) in Peru constitute crimes against humanity under international law." Fujimori's alleged association with death squads is currently[when?] being studied by the Inter-American Court of Human Rights, after the court accepted the case of "Cantuta vs Perú". The 1991 Barrios Altos massacre by members of the death squad Grupo Colina, made up solely of members of the Peruvian armed forces, was one of the crimes that Peru cited in its request to Japan for his extradition in 2003. From 1996 to 2000, the Fujimori government oversaw a massive forced sterilization campaign known as Voluntary Surgical Contraception. The United Nations and other international aid agencies supported this campaign. USAID provided funding and training until it was exposed by objections by churches and human rights groups. The Nippon Foundation, headed by Ayako Sono, a Japanese novelist and personal friend of Fujimori, supported as well. Over 215,000 people, mostly women, entirely indigenous, were forced or threatened into sterilization and 16,547 men were forced to undergo vasectomies during these years, most of them without a proper anaesthetist, in contrast to 80,385 sterilisations and 2,795 vasectomies over the previous three years. The success of the military operation in the Japanese embassy hostage crisis was tainted by subsequent allegations that at least three and possibly eight of the insurgents were summarily executed by the commandos after surrendering. In 2002, the case was taken up by public prosecutors, but the Peruvian Supreme Court ruled that the military tribunals had jurisdiction. A military court later absolved them of guilt, and the "Chavín de Huantar" soldiers led the 2004 military parade. In response, in 2003 MRTA family members lodged a complaint with the Inter-American Commission on Human Rights (IACHR) accusing the Peruvian state of human rights violations, namely that the MRTA insurgents had been denied the "right to life, the right to judicial guarantees and the right to judicial protection". The IACHR accepted the case and is currently[when?] studying it. Peruvian Minister of Justice Maria Zavala has stated that this verdict[clarification needed] by the IACHR supports the Peruvian government's extradition of Fujimori from Chile. Though the IACHR verdict does not directly implicate Fujimori, it does fault the Peruvian government for its complicity in the 1992 Cantuta University killings. 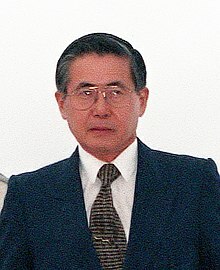 Alberto Fujimori left Peru in November 2000 to attend a regional summit in Brunei. He then traveled on to Japan. Once there, he announced plans to remain in the country and faxed his resignation letter to Congress. After Congress rejected Fujimori's faxed resignation, they relieved Fujimori of his duties as president and banned him from Peruvian politics for a decade. He remained in self-imposed exile in Japan, where he resided with his friend, the famous Catholic novelist Ayako Sono. Several senior Japanese politicians have supported Fujimori, partly because of his decisive action in ending the 1997 Japanese embassy crisis. Alejandro Toledo, who assumed the Peruvian presidency in 2001, spearheaded the criminal case against Fujimori. He arranged meetings with the Supreme Court, tax authorities, and other powers in Peru to "coordinate the joint efforts to bring the criminal Fujimori from Japan." His vehemence in this matter at times compromised Peruvian law: forcing the judiciary and legislative system to keep guilty sentences without hearing Fujimori's defense; not providing Fujimori with representation when Fujimori was tried in absentia; and expelling pro-Fujimori congressmen from the parliament without proof of the accusations against those congressmen. These expulsions were later reversed by the judiciary. The Peruvian Congress authorized charges against Fujimori in August 2001. Fujimori was alleged to be a co-author, along with Vladimiro Montesinos, of the death-squad killings at Barrios Altos in 1991 and La Cantuta in 1992. At the behest of Peruvian authorities, Interpol issued an arrest order for Fujimori on charges that included murder, kidnapping, and crimes against humanity. Meanwhile, the Peruvian government found that Japan was not amenable to the extradition of Fujimori; a protracted diplomatic debate ensued, when Japan showed itself unwilling to accede to the extradition request. Fujimori had been granted Japanese citizenship after his arrival in the country, and the Japanese government maintained that Japanese citizens would not be extradited. In September 2003, Congressman Dora Dávila, joined by Minister of Health Luis Soari, denounced Fujimori and several of his ministers for crimes against humanity, for allegedly having overseen forced sterilizations during his regime. In November, Congress approved an investigation of Fujimori's involvement in the airdrop of Kalashnikov rifles into the Colombian jungle in 1999 and 2000 for guerrillas of the Revolutionary Armed Forces of Colombia (FARC). Fujimori maintained he had no knowledge of the arms-trading, and blamed Montesinos. By approving the charges, Congress lifted the immunity granted to Fujimori as a former president, so that he could be criminally charged and prosecuted. Congress also voted to support charges against Fujimori for the detention and disappearance of 67 students from the central Andean city of Huancayo and the disappearance of several residents from the northern coastal town of Chimbote during the 1990s. It also approved charges that Fujimori mismanaged millions of dollars from Japanese charities, suggesting that the millions of dollars in his bank account were far too much to have been accumulated legally. In 2004, the Special Prosecutor established to investigate Fujimori released a report alleging that the Fujimori administration had obtained US$2 billion though graft. Most of this money came from Vladimiro Montesinos' web of corruption. The Special Prosecutor's figure of two billion dollars is considerably higher than the one arrived at by Transparency International, an NGO that studies corruption. Transparency International listed Fujimori as having embezzled an estimated USD $600 million, which would rank seventh in the list of money embezzled by heads of government active within 1984–2004. Fujimori dismissed the judicial proceedings underway against him as "politically motivated", citing Toledo's involvement. Fujimori established a new political party in Peru, Sí Cumple, working from Japan. He hoped to participate in the 2006 presidential elections, but in February 2004, the Constitutional Court dismissed this possibility, because the ex-president was specifically barred by Congress from holding any office for ten years. Fujimori saw the decision as unconstitutional, as did his supporters such as ex-congressmembers Luz Salgado, Marta Chávez and Fernán Altuve, who argued it was a "political" maneuver and that the only body with the authority to determine the matter was the Jurado Nacional de Elecciones (JNE). Valentín Paniagua disagreed, suggesting that the Constitutional Court finding was binding and that "no further debate is possible". Fujimori's Sí Cumple (roughly translated, "He Keeps His Word") received more than 10% in many country-level polls, contending with APRA for the second place slot, but did not participate in the 2006 elections after its participation in the Alliance for the Future (initially thought as Alliance Sí Cumple) had not been allowed. By March 2005, it appeared that Peru had all but abandoned its efforts to extradite Fujimori from Japan. In September of that year, Fujimori obtained a new Peruvian passport in Tokyo and announced his intention to run in the Peruvian national election, 2006. He arrived in Chile in November 2005, but hours after his arrival there he was arrested. Peru then requested his extradition. While under house arrest in Chile, Fujimori announced plans to run in Japan's Upper House elections in July 2007. Fujimori was extradited from Chile to Peru in September 2007. On 7 April 2009 a three-judge panel convicted Fujimori on charges of human rights abuses, declaring that the "charges against him have been proven beyond all reasonable doubt". The panel found him guilty of ordering the Grupo Colina death squad to commit the November 1991 Barrios Altos massacre and the July 1992 La Cantuta Massacre, which resulted in the deaths of 25 people, as well as for taking part in the kidnappings of Peruvian opposition journalist Gustavo Gorriti and businessman Samuel Dyer. Fujimori's conviction is the only instance of a democratically elected head of state being tried and convicted of human rights abuses in his own country. Later on 7 April, the court sentenced Fujimori to 25 years in prison. He faced a third trial in July 2009 over allegations that he illegally gave $15 million in state funds to Vladimiro Montesinos, former head of the National Intelligence Service, during the two months prior to his fall from power. Fujimori admitted paying the money to Montesinos but claimed that he had later paid back the money to the state. On 20 July, the court found him guilty of embezzlement and sentenced him to a further seven and a half years in prison. A fourth trial took place in September 2009 in Lima. Fujimori was accused of using Montesinos to bribe and tap the phones of journalists, businessmen and opposition politicians – evidence of which led to the collapse of his government in 2000. Fujimori admitted the charges but claimed that the charges were made to damage his daughter's presidential election campaign. The prosecution asked the court to sentence Fujimori to eight years imprisonment with a fine of $1.6 million plus $1 million in compensation to ten people whose phones were bugged. Fujimori pleaded guilty and was sentenced to six years' imprisonment on 30 September 2009. Under Peruvian law, all prison sentences run concurrently. Press reports in late 2012 indicated that Fujimori was suffering from tongue cancer and other medical problems. His family asked President Ollanta Humala for a pardon. President Humala rejected a pardon in 2013, saying that Fujimori's condition was not serious enough to warrant it. In July 2016, with three days left in his term, President Humala said that there was insufficient time to evaluate a second request to pardon Fujimori, leaving the decision to his successor Pedro Pablo Kuczynski. On 24 December 2017, President Kuczynski pardoned him on health grounds. Kuczynski's office stated that the hospitalized 79-year-old Fujimori had a "progressive, degenerative and incurable disease". The pardon kicked off at least two days of protests and led at least three congressmen to resign from Kucyznski's party. A spokesman for Popular Force alleged there was a pact that, in exchange for the pardon, Popular Force members helped Kuczynski fight ongoing impeachment proceedings. On 3 October 2018, the Peruvian Supreme Court reversed Fujimori's pardon and ordered his return to prison. He was rushed to a hospital and returned to prison on 23 January 2019. His pardon was formally annulled on 13 February 2019. High growth during Fujimori's first term petered out during his second term. "El Niño" phenomena had a tremendous impact on the Peruvian economy during the late 1990s. Nevertheless, total GDP growth between 1992 and 2001, inclusive, was 44.60%, that is, 3.76% per annum; total GDP per capita growth between 1991 and 2001, inclusive, was 30.78%, that is, 2.47% per annum. Also, studies by INEI, the national statistics bureau show that the number of Peruvians living in poverty increased dramatically (from 41.6% to more than 70%) during Alan García's term, but they actually decreased (from more than 70% to 54%) during Fujimori's term. Furthermore, FAO reported Peru reduced undernourishment by about 29% from 1990–92 to 1997–99. Peru was reintegrated into the global economic system, and began to attract foreign investment. The sell-off of state-owned enterprises led to improvements in some service industries, notably local telephony, mobile telephony and Internet. For example, before privatization, a consumer or business had to wait up to 10 years to get a local telephone line installed by the state-run telephone company, at a cost of $607 for a residential line. A couple of years after privatization, the wait was reduced to just a few days. Peru's Physical land based telephone network had a dramatic increase in telephone penetration from 2.9% in 1993 to 5.9% in 1996 and 6.2% in 2000, and a dramatic decrease in the wait for a telephone line. Average wait went from 70 months in 1993 (before privatization) to two months in 1996 (after privatization). Privatization also generated foreign investment in export-oriented activities such as mining and energy extraction, notably the Camisea gas project and the copper and zinc extraction projects at Antamina. By the end of the decade, Peru's international currency reserves were built up from nearly zero at the end of García's term to almost US$10 billion. Fujimori also left a smaller state bureaucracy and reduced government expenses (in contrast to the historical pattern of bureaucratic expansion), a technically minded (but widely perceived as politicized) administration of public entities like SUNAT (the tax collection agency), a large number of new schools, not only in Lima but in Peru's small towns, more roads and highways, and new and upgraded communications infrastructure. These improvements led to a revival in tourism, agroexport, industries and fisheries. Fujimori's privatization program also remains shrouded in controversy. A congressional investigation in 2002, led by socialist opposition congressman Javier Diez Canseco, stated that of the USD $9 billion raised through the privatizations of hundreds of state-owned enterprises, only a small fraction of this income ever benefited the Peruvian people. Some scholars claim that Fujimori's government became a "dictatorship" after the auto-coup, permeated by a network of corruption organized by his associate Montesinos, who now faces dozens of charges that range from embezzlement to drug trafficking to murder (Montesinos is currently[when?] on trial in Lima). Fujimori's style of government has also been described as "populist authoritarianism". Numerous governments and human rights organizations such as Amnesty International, have welcomed the extradition of Fujimori to face human rights charges. As early as 1991, Fujimori had himself vocally denounced what he called "pseudo-human rights organizations" such as Amnesty International and Americas Watch, for allegedly failing to criticize the insurgencies targeting civilian populations throughout Peru against which his government was struggling. In the 2004 Global Transparency Report, Fujimori made into the list of the World's Most Corrupt Leaders. He was listed seventh and he was said to have amassed $600 million, but despite years of incarceration and investigation, none of these supposed stolen funds have ever been located in any bank account anywhere in the world. Fujimori did have support within Peru. The Universidad de Lima March 2003 poll, taken while he was in Japan, found a 41% approval rating for his administration. A poll conducted in March 2005 by the Instituto de Desarrollo e Investigación de Ciencias Económicas (IDICE) indicated that 12.1% of the respondents intended to vote for Fujimori in the 2006 presidential election. A poll conducted on 25 November 2005, by the Universidad de Lima indicated a high approval (45.6%) rating of the Fujimori period between 1990 and 2000, attributed to his counterinsurgency efforts (53%). An article from La Razon, a Peruvian newspaper, stated in 2003 that: "Fujimori is only guilty of one big crime and it is that of having been successful in a country of failed politicians, creators of debt, builders of mirages, and downright opportunistic." According to a more recent Universidad de Lima survey, Fujimori still retains public support, ranking fifth in personal popularity among other political figures. Popular approval for his decade-long presidency (1990–2000) has reportedly grown (from 31.5% in 2002 to 49.5% in May 2007). Despite accusations of corruption and human rights violations, nearly half of the individuals interviewed in the survey approved of Fujimori's presidential regime. In a 2007 Universidad de Lima survey of 600 Peruvians in Lima and the port of Callao, 82.6% agreed that the former president should be extradited from Chile to stand trial in Peru. The Lima-based newspaper Perú 21 ran an editorial noting that even though the Universidad de Lima poll results indicate that four out of every five interviewees believe that Fujimori is guilty of some of the charges against him, he still enjoys at least 30% of popular support and enough approval to restart a political career. In the 2006 congressional elections, his daughter Keiko was elected to the congress with the highest vote count. She came in second place in the 2011 Peruvian presidential election with 23.2% of the vote, and lost the June run-off against Ollanta Humala. She again ran for President in the 2016 election, narrowly losing the run-off to Pedro Pablo Kuczynski. ^ "Fujimori gets married from cell". BBC News. 6 April 2006. ^ "Historial Partidario – Alberto Fujimori Fujimori". National Jury of Elections. Archived from the original on 8 October 2018. Retrieved 8 October 2018. ^ a b c "Mass sterilization scandal shocks Peru". BBC News. 24 July 2002. Retrieved 30 April 2006. ^ a b "Peru's Fujimori sentenced to 25 years prison". Reuters. 7 April 2009. Retrieved 7 April 2009. ^ a b Highlights from the Global Corruption Report 2004, Transparency International, 25 March 2004. Accessed 26 September 2006. ^ "Peru's Fujimori, already jailed, slapped with another prison term". Reuters. 2015. Retrieved 26 December 2017. ^ a b "Peru's ex-leader Fujimori asks for forgiveness amid heated protests". CNN. Retrieved 26 December 2017. ^ Collyns, Dan (3 October 2018). "Peru's high court overturns pardon of former strongman Fujimori". the Guardian. Retrieved 22 October 2018. ^ a b "Peru's Fujimori, pardon annulled, forced back to prison". Reuters. 24 January 2019. Retrieved 3 February 2019. ^ a b "Peru Supreme Court keeps Fujimori in jail". The West Australian. 13 February 2019. Retrieved 15 February 2019. ^ Champion, Margaret Y. (2006). Peru and the Peruvians in the Twentieth Century: Politics and Prospects. New York: Vantage Press. p. 476. ISBN 0-533-15159-7. ^ a b c McClintock, Cynthia; Fabián Vallas (2002). The United States and Peru. New York: Routledge. p. 50. ISBN 0-415-93463-X. ^ González Manrique, Luis Esteban (1993). La encrucijada peruana: de Alan García a Fujimori (in Spanish). Madrid: Fundación CEDEAL. p. 467. ISBN 84-87258-38-7. ^ a b c Valenzuela, Cecilia (1997). "Buscando La Cuna De Fujimori". Caretas (1475): 27. ^ Dartnell, Michael York (2006). "Insurgency Online: Web Activism and Global Conflict". Toronto: University of Toronto Press. p. 77. ISBN 0-8020-8747-7. ^ "Fujimori's documents raise fresh controversy". Associated Press. 27 July 1997. Archived from the original on 8 January 2009. Retrieved 7 April 2009. ^ Waisbord, Silvio Ricardo (2000). Watchdog Journalism in South America. New York: Columbia University Press. p. 83. ISBN 0-231-11975-5. ^ Prieto Celi, Federico (1997). Rescate en Lima (in Spanish). Lima: Realidades S.A. p. 32. OCLC 37997948. ^ Jochamowitz, Luis (1994). Ciudadano Fujimori: la construcción de un político (in Spanish) (2nd ed.). Lima: PEISA. p. 87. OCLC 31847656. ^ "Alberto Fujimori". Encyclopedia Britannica. 27 December 2017. Retrieved 27 December 2017. ^ "La frugalidad de "Cambio 90" y el derroche de Fredemo" (in Spanish). El Proceso. 14 April 1990. Retrieved 27 December 2017. ^ Ignacio López-Calvo (2013). "The Affinity of the Eye: Writing Nikkei in Peru". Retrieved 27 December 2017. ^ Kenney, Charles D. (2004). Fujimori's coup and the breakdown of democracy in Latin America. University of Notre Dame Press. ISBN 0-268-03171-1. ^ a b c Barry S. Levitt (2006). "A desultory defense of democracy: OAS Resolution 1080 and the Inter-American Democratic Charter. (Organization of American States)". Latin American Politics and Society. 48 (3). pp. 93–123. ^ "Mensaje a la nación del presidente del Perú, ingeniero Albert Fujimori Fujimori" (PDF) (in Spanish). Peruvian National Congress. 5 April 1992. Retrieved 26 September 2006. ^ Organization of American States (OAS) (1992). "Ser. G MRE/RES 1/92 April 13". ^ Cameron, Maxwell A.; Mauceri, Philip (1997). The Peruvian Labyrinth. p. 216. ^ Ulla D. Berg (2015). Mobile Selves: Race, Migration, and Belonging in Peru and the U.S. NYU Press. p. 214. ISBN 1479896098. Retrieved 3 June 2016 – via Google Books. ^ Conaghan, Catherine M. (2006). Fujimori's Peru: Deception in the Public Sphere. p. 55. ^ a b Heritage, Andrew (December 2002). Financial Times World Desk Reference. Dorling Kindersley. pp. 462–465. ISBN 9780789488053. ^ National Security Archive (15 June 1995). "Fujimori signs amnesty law". Peruvian Ministry of Culture. Retrieved 27 December 2017. ^ Cathleen Caron, Judiciary Firmly Under Control in Fujimori's Peru Archived 7 February 2012 at the Wayback Machine, Human Rights Brief, Volume 6 Issue 1 (1999). p.9 et. seq. ^ David R. Mares (2001). Violent Peace: Militarized Interstate Bargaining in Latin America. New York: Columbia University Press. p. 161. ^ Nohlen, D (2005). Elections in the Americas: A data handbook, Volume II. p. 454. ISBN 978-0-19-928358-3. ^ Freeman, Michael. Freedom Or Security: The Consequences for Democracies Using Emergency Powers. 2003, p. 150. ^ Freeman, Michael. Freedom Or Security: The Consequences for Democracies Using Emergency Powers. 2003, page 148. ^ Freeman, Michael. Freedom Or Security: The Consequences for Democracies Using Emergency Powers. 2003, p. 159. ^ Fujimori advances this argument in Ellen Perry's documentary film, The Fall of Fujimori. ^ Stern, Steve J. Shining and Other Paths: War and Society in Peru, 1980–1995. 1998, page 307. ^ Ellen Perry's The Fall of Fujimori. ^ Brewer, Paul. The Lima Embassy Siege and Latin American Terrorism. 2006, page 12. ^ Japanese embassy hostage crisis in Peru started 10 years ago Archived 6 January 2007 at the Wayback Machine 18 December 2006. Retrieved 26 December 2006. ^ Conaghan, Catherine M. Fujimori's Peru: Deception in the Public Sphere. 2006, page 129. ^ David Pilling, Peru tiring of bid to secure Fujimori return, Financial Times, 31 March 2005. Retrieved 26 September 2006. ^ (in Spanish) Valle Riestra: Pedido de extradición de Fujimori será rechazado por Chile Archived 24 November 2005 at the Wayback Machine RPP Noticias, 16 November 2005. Retrieved 26 September 2006. ^ McClintock, Cynthia and Vallas, Fabian. The United States and Peru: Cooperation at a Cost. 2003, p. 163. ^ a b "Peru's Fujimori Enters Election". CBS News. 6 October 2005. ^ a b Forero, Juan. Peruvians Fight Graft One Case At a Time. The New York Times, 5 April 2004. ^ "Suharto Tops World Corruption League". Archived from the original on 17 July 2004. Retrieved 2005-04-02. CS1 maint: BOT: original-url status unknown (link), 25 March 2004, Laksamana.Net, Jakarta. ^ (in Spanish) No hay nada más que discutir sobre candidatura de Fujimori, Noticias on terra.com.peru, 27 February 2006 credited to Andina. Retrieved 26 September 2006. ^ (in Spanish) Salgado: JNE debe ser quien defina postulación de Fujimori, Noticias on terra.com.peru, 21 February 2005 credited to Expreso. Retrieved 26 September 2006. ^ Brooke, James. An Ex-President of Peru Plots His Return. The New York Times, 24 February 2004. ^ "Still wanted in Peru, Alberto Fujimori runs for office in Japan". Christian Science Monitor. 25 July 2007. ISSN 0882-7729. Retrieved 25 October 2018. ^ "Peru's Fujimori convicted of human rights crimes". Reuters. 7 April 2009. Retrieved 7 April 2009. ^ William Neuman (8 January 2015). "Peru: Jailed Ex-President Is Convicted of Corruption". New York Times. ^ "Peru court finds Fujimori guilty". Agence France-Presse. 7 April 2009. Retrieved 7 April 2009. ^ Mapstone, Naomi (7 April 2009). "Fujimori convicted of human rights crimes". The Financial Times. Retrieved 7 April 2009. ^ "Peru's Fujimori guilty of murder". Associated Press. Toronto. 7 April 2009. Retrieved 7 April 2009. ^ a b "Fujimori convicted of corruption". BBC News. 20 July 2009. Retrieved 3 October 2009. ^ a b c d "Fujimori sentenced for corruption". BBC News. 30 September 2009. Retrieved 3 October 2009. ^ a b c "Fujimori pleads guilty to bribery". BBC News. 28 September 2009. Retrieved 3 October 2009. ^ "Peru president rules out pardon for ex-leader Fujimori". BBC. 26 July 2016. Retrieved 7 August 2016. ^ "Alberto Fujimori Files New Request for Presidential Pardon". Andean Air Mail & Peruvian Times. Lima: Eleanor Griffis. 25 July 2016. Retrieved 7 August 2016. The Presidential Pardons Commission met this Monday to begin evaluating a request filed on Friday July 22 by ex-President Alberto Fujimori, who is serving a 25-year prison sentence for crimes against humanity. ^ Taj, Mitra (26 July 2016). Fernandez, Clarence (ed.). "Peru's Humala rules out pardoning Fujimori during his term". Reuters. Retrieved 7 August 2016. Humala, who will be replaced by centrist President-elect Pedro Pablo Kuczynski on Thursday, said in a broadcast interview that a serious evaluation of Fujimori's pardon request would take at least a couple months. ^ Dan Collyns (24 December 2017). "Peru's jailed ex-president Alberto Fujimori pardoned, sparking protests". The Guardian. Retrieved 24 December 2017. ^ Collyns, Dan (3 October 2018). "Peru's high court overturns pardon of former strongman Fujimori". the Guardian. Retrieved 25 October 2018. ^ Gastón Antonio Zapata Velasco, Kenneth Broad, et al., Peru Country Case Study: Impacts and Responses to the 1997–98 El Niño Event Archived 5 September 2006 at the Wayback Machine, Peru Country Case Study supported by the International Research Institute for climate prediction (IRI) and NOAA's Office of Global Programs as a contribution to the UNEP/NCAR/WMO/UNU/ISDR study for the UN Foundation. Retrieved 27 September 2006. ^ El Entorno Archived 11 April 2005 at the Wayback Machine, Atlas Internet Perú – Red Científica Peruana, 2003. Retrieved 26 September 2006. ^ (in Spanish) Las Privatizaciones y la Pobreza en el Perú: Resultados y Desafios Archived 21 July 2006 at the Wayback Machine (PowerPoint presentation), unsigned, undated, on the site of El Área de Economía de la Regulación, Centro de Investigación de la Universidad del Pacífico (CIUP). Retrieved 27 September 2006. ^ Peru after Privatization: Are Telephone Consumers Better Off? Archived 16 November 2016 at the Wayback Machine. Máximo Torero, Enrique Schroth, and Alberto Pascó-Font. Retrieved 4 October 2006. ^ Líneas en servicio y densidad en la telefonía fija y móvil: 1993 – 2006 Archived 25 October 2006 at the Wayback Machine Excel spreadsheet, on the site of Peru's Ministry of Transport and Communications. Retrieved 28 September 2006. ^ (in Spanish) Noti-Aprodeh Archived 19 February 2006 at the Wayback Machine, 8 April 2003, Asociación Pro Derechos Humanos (APRODEH). Accessed 28 September 2006. ^ "Chile, Peru – How much do mining companies contribute? The debate on royalties is not over yet", Latinamerica Press, Special Edition – The Impact of Mining Latinamerica Press, Vol. 37, No. 2, 26 January 2005. ISSN 0254-203X. Accessible online Archived 16 April 2005 at the Wayback Machine as a Microsoft Word document. Retrieved 26 September 2006. There appears to be a separate HTML copy of the article on the site of Carrefour Amérique Latine (CAL). Retrieved 27 September 2006. ^ "Peru: Public consultation says NO to mining in Tambogrande", pp.14–15 in WRM Bulletin # 59, June 2002 (World Rainforest Movement, English edition). Accessible online Archived 10 March 2005 at the Wayback Machine as Rich Text Format (RTF) document. Retrieved 26 September 2006. ^ "A Backwards, Upside-Down Kind of Development": Global Actors, Mining and Community-Based Resistance in Honduras and Guatemala Archived 3 November 2005 at the Wayback Machine, Rights Action, February 2005. Retrieved 27 September 2006. ^ Natalie Obiko Pearson (20 July 2003). "In Japan, Fujimori Covets Post in Peru: Disgraced president plots his return to power in a land that accuses him of murder, treason and embezzlement". Associated Press. Retrieved 3 June 2016. ^ García, Fujimori Top Candidates In Peru Archived 25 October 2005 at the Wayback Machine, Angus Reid Global Monitor (Angus Reid Consultants), 30 March 2005. Accessed 27 September 2006. ^ Peruvians Call for Fujimori's Extradition[permanent dead link] Angus Reid Global Monitor (Angus Reid Consultants), 12 May 2007. Retrieved 19 May 2007. ^ Rafael Romo; Helena DeMoura (6 June 2011). "Left-leaning Humala wins Peruvian presidential election". CNN. Retrieved 3 June 2016. Wikimedia Commons has media related to Alberto Fujimori. "Alberto Fujimori collected news and commentary". The New York Times.